A Southern Live Oak in South Carolina during winter. ↑ Aerts, R. (1995). "The advantages of being evergreen". Trends in Ecology & Evolution 10 (10): 402–407. 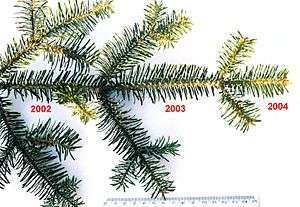 ↑ Matyssek, R. (1986) "Carbon, water and nitrogen relations in evergreen and deciduous conifers". Tree Physiology 2: 177–187. ↑ Sobrado, M. A. (1991) "Cost-Benefit Relationships in Deciduous and Evergreen Leaves of Tropical Dry Forest Species". Functional Ecology 5 (5): 608–616. Helen Ingersoll (1920). "Evergreens". Encyclopedia Americana.